The Green Bay Packers are moving on without cornerback Sam Shields. 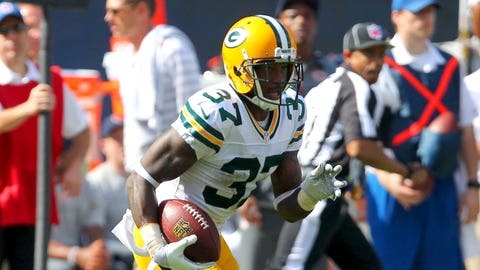 In a move that was not unexpected, cornerback Sam Shields announced on his Instagram page that he has been released by the Green Bay Packers. The team confirmed the move late Wednesday afternoon. Shields played just one game in 2016 after suffering a concussion in Week 1. The cornerback has a history of concussions, suffering at least four in his seven years with the Packers. In his Instagram post, Shields used a myriad of hashtags to describe his feelings, including #AtleastLeMeRetireFromThePack, #BusinessIsBusiness, #ICantPlayWithAnybodyElse, #ImDone and #NoMoreFreezingWeather. Shields arrived in Green Bay in 2010 as an undrafted free agent from Miami, where he played wide receiver. Converted to cornerback, he had 245 tackles and 18 interceptions with the Packers, recording at least two picks in each of his first six seasons. Shields established himself quickly, and was Green Bay’s nickel cornerback as a rookie in the Packers’ Super Bowl season in 2010. He recorded two interceptions against Chicago in a 21-14 win in the NFC Championship Game that season. Overall, Shields had five interceptions in 11 playoff games. Shields developed into a starter by 2013 and made the Pro Bowl in 2014. Back in October, while on injured reserve, Shields was charged with possession of marijuana and of drug paraphernalia. By cutting Shields now, the Packers will save $9 million against the salary cap, with $3,125,000 in dead money, according to OvertheCap.com.